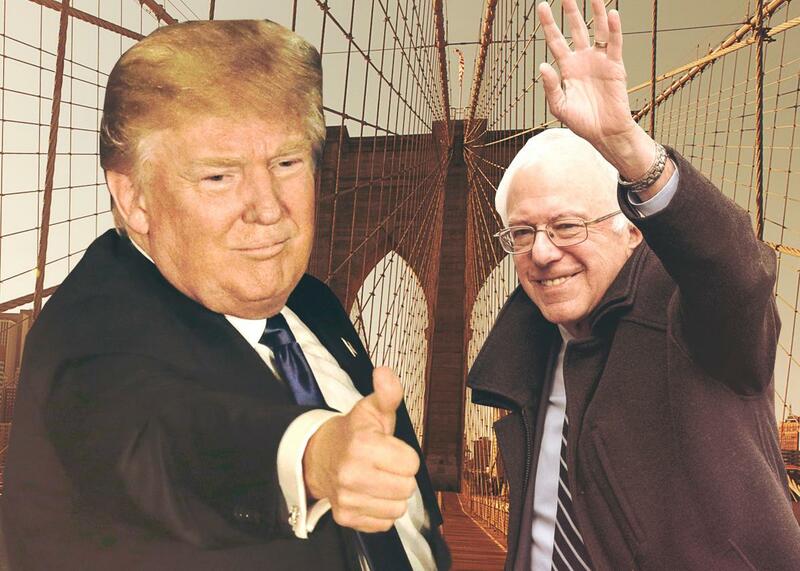 Bernie Sanders, Donald Trump, and winning with New York values. Voters are in a New York state of mind. Photo illustration by Lisa Larson-Walker. Photos by Getty Images, Reuters, Thinkstock. The people of New Hampshire, both Democrat and Republican, voiced their anger at the American political establishment last night, and they did it in a thick New York accent. As for Trump: I, a son of New York, had initially dismissed his electoral chances for the same reason I never really took Rudy Giuliani or Mike Bloomberg seriously as national candidates: too socially liberal, too secular, too brash, and too, well, New York to win over Republicans outside the Northeast. But primary voters throughout the country sure are taken with Trump’s tough guy, outer-borough, xenophobic shtick. You could call it Sal’s Pizzeria conservatism, even though Trump’s famous “yuuuuges” and “fantaaastics” mask a privileged upbringing and Wharton education. This is a big deal. It’s never been easy for successful tri-state area characters to make the jump to nationwide success. Sure, they might get plenty of ego-stroking media buzz, thanks to the New York–based major news outlets. But, contra Frank Sinatra, the political profile that allows one to make it New York has often been a liability when trying to make it anywhere else. Ted Cruz’s attack on Trump’s “New York values” ahead of the Iowa caucus—“socially liberal or pro-abortion or pro–gay marriage … Focus around money and the media”—was nothing new in presidential politics. New York candidates have faced the attack that they’re not quite American enough since at least 1928, when Democrats nominated another guy with a thick New Yawk accent, the progressive governor Al Smith, to run against Herbert Hoover. Smith grew up in poverty on the Lower East Side and used “The Sidewalks of New York” as his campaign song but faced vicious attacks on his Irish heritage and Roman Catholicism and was tailed on the campaign trail by the Ku Klux Klan. The last president from New York was the patrician Franklin Roosevelt of the Hudson Valley. Since then it’s been a rough ride. New York Gov. Nelson Rockefeller tried unsuccessfully to win the nomination three times in the 1960s as a liberal Republican with a scandalous personal life in an era when his party was moving rapidly to the right. He eventually became Gerald Ford’s unelected vice president but was unceremoniously dropped from the ticket in 1976 when Ford needed to appeal to conservatives. But this election, something’s changed. Even aside from Trump and Sanders, it’s a remarkably New York–centric race. If Democrats ultimately reject Sanders, they’ll be backing a former New York senator who calls Chappaqua home. The specter of a third-party run by Bloomberg still hangs over the contest. The American electorate as a whole is becoming more urban, more socially liberal, and more culturally diverse—a source of hope for some and terror for others. In short, America is looking more like New York. New York values, of one brand or another, may be exactly what voters are looking for. *Correction, Feb. 10, 2016: This post originally misstated that President George H.W. Bush was born in Connecticut. He spent much of his childhood in Connecticut but was born in Massachusetts.